Condo on the beach with hot tub and pool and walking distance to everything! Below you will find details about our home, Capri by the Sea 102 located in Pacific Beach. 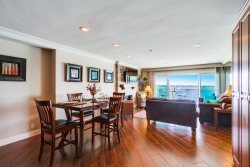 Stay at this oceanfront condo at one of the only high rise buildings on the beach in Pacific Beach. Steps away from the boardwalk, crystal pier, and all the shops, restaurants, and bars on Garnet Avenue. Enjoy WiFi, pool and hot tub, rooftop views for miles and the comfort of the beach just outside your balcony! Relax to the sound of the waves hitting the beach from this 1st floor paradise. Walk along the boardwalk right outside the front door or take a swim in the heated pool, relax in the spa and sauna or hit the beach and enjoy the sun and surf. Our Condo is fully furnished! The Capri has any many unique condos and this unit is no exception. The views have been highlighted in this unit with floor to ceiling windows that encompass every inch of the viewable space you could have from this amazing home. Located on the 1st floor, the views are simply breathtaking. The building has a washer and dryer on each floor (coin operated). There are gas grills on the roof and while you make dinner you can enjoy the view of the City or the Ocean. If you are not in mood for cooking visit one of the many fine restaurants all within walking distance! We supply all linens have a complete kitchen. The building has security guards and key fob-only access. One underground parking space is included and additional parking can be purchased from the Association. There are many bike and surfboard rentals very close by. This home has flat screen TV's in both the living room and bedroom. A nice stereo system is also available in the living room. The kitchen is very well equipped with many small appliances and utensils you wouldn't find at other vacation rentals. The condo is only a small part of what makes this home truly a unique vacation. The building has a rooftop deck 12 stories up with 360 degree views of Pacific and Mission Beach. The deck is equipped with lounge chairs, picnic tables and barbecues. Stay at the Capri and you will be back. The location, amenities, and views are some of the best in the city! Please note: The balconies at the Capri are NOT for standing. DO NOT lean on the railings. The Capri by the Sea has asked for our cooperation in their new safety proceedings. The incredible views of the beach, boardwalk and ocean are not affected! No A/C, portable fan available, sea breeze! Ashley was great. Security at Capri very helpful since fobs weren't programmed correctly. Fabulous location. This unit needs a bit if work but was comfortable. Other units in Capri have been very nice. Wasn�t very happy with set up. Doesn�t compare to the unit on the 10th floor. Unit was outdated and needs upgrades to kitchen.